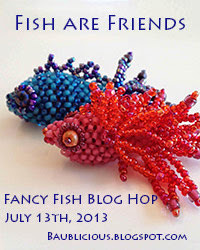 Today's the day for the Fish are Friends Blog Hop. Thank you to all the members of my Design Team, and to everyone else who participated in this challenge and hop. The goal again was to use my Fancy Fish tutorial, or another favorite fish pattern to create wonderful new creations. For my own entry, I wanted to do something different. You've already seen my Fancy Fish. Some new, larger core beads seemed like a great place to start. 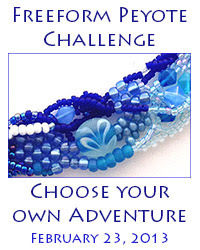 The photo at left shows one of the larger beads in comparison to the standard sized core beads I use. Then a friend asked if I could stitch a Lionfish. I didn't want to try to go for photo realism, but Lionfish and Scorpionfish are such fun with their spikes and plumes. So I decided to take artistic license, lots of artistic license, and see where it took me. My new fish is an extrapolation from my original pattern - you won't find the exact instructions for it in my PDF, but rather it is an outgrowth of the pattern. I stitched two fish, but I think I may save the second and try submitting it to some magazines. My latest, very Fancy Fish - isn't her topknot fun? 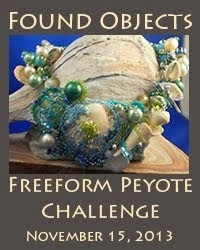 Oh, and later this week, I'll be hosting a giveaway here on my blog for some core beads for Fancy Fish. Karen thanks so much for hosting and sharing your fish with us! I had so much fun stitching up my little guys. Great pattern! so easy to follow!! and detailed .... I can see exactly how you'd take some creative license and add variations to the fins. I love the new version with the 'branch-like' fins ... they look like coral. My girls really loved the little fish I made. thank you, thank you! Karen, what a fantastic fishy friend! Absolutely adorable. I love your fish, Karen. I'm sorry I didn't get involved in you hop. I looks like everyone had a great time! Your bigger fish is beautiful and I love the new bigger bead. 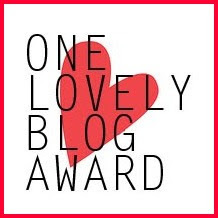 Thank you for hosting the blog hop and for letting me be part of your team. I had a great deal of fun with your tutorial (as did my daughter). She adores the fish I made. Oohh! Loving that tail! 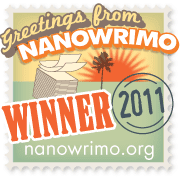 Yes, you should definitely submit, these guys are so much fun, and such a great way to learn RAW better. Thanks for sharing your talent, my friend! 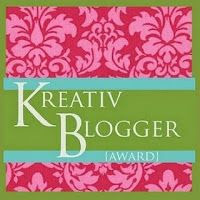 Thanks again for hosting this Blog Hop and for including me on the Design Team. This was really fun. I love the leafy fringe on the tail of the blue fish. If you tilted your fish vertical and did some funky shaping, it would also make an awesome seahorse. I am thinking about those leafy sea dragon sea horses that look just like the plants they hide in. Wow, what a lot of colour and texture inspiration, even for a non-beader like me, Karen... your little guys are just adorable!